Area: Trail access is via the eastern part of Smith River National Recreation Area. The trail is in the Siskiyou Wilderness. Difficulty: Moderate with 1 mile total of difficult steep switchbacks. Directions to Trailhead: From HWY 199 take Little Jones Creek Road, just north of Patrick Creek Resort. Follow the blacktop about 15 miles to the Bear Basin turnoff (14N04). Turn left and follow the winding, gravel road to the low quality Siskiyou Pass Road. Turn left again and proceed to the parking area at the Wilderness boundary. If you reach the South Fork of the Smith, you’ve missed the Siskiyou Pass turnoff. When the low country warms up it is time to head to the higher elevations of the Siskiyou Mountains, the northern most and largest sub-range of the Klamath Mountain range. The Doe Flat Trailhead begins at 3,400 feet elevation, and climbs to a height of 4,700 feet at Devil’s Punchbowl where trees give way to subalpine scrub and breezes cool the air. The hike to Devil’s Punchbowl is a rewarding summertime trek that begins in the Smith River National Recreation Area (NRA) and takes you into the Siskiyou Wilderness. 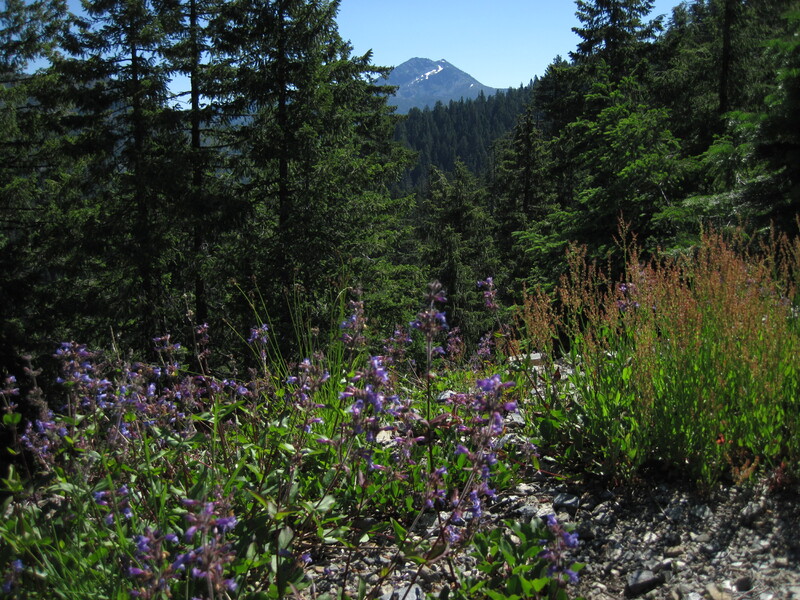 The Siskiyou Wilderness was designated as a wilderness area by the California Wilderness Act of 1984 and spans three national forests: Siskiyou, Klamath and Six Rivers for a total of 182,802 acres. It is one the richest temperate coniferous forests in the world. Much of its extensive biodiversity is due to the fact that the region escaped extensive glaciation during recent ice ages. One of the few glaciers that did occur created the Punchbowl as the glacier originating from Bear Mountain created a depression at its head leaving behind a small lake, or cirque, as it melted away. 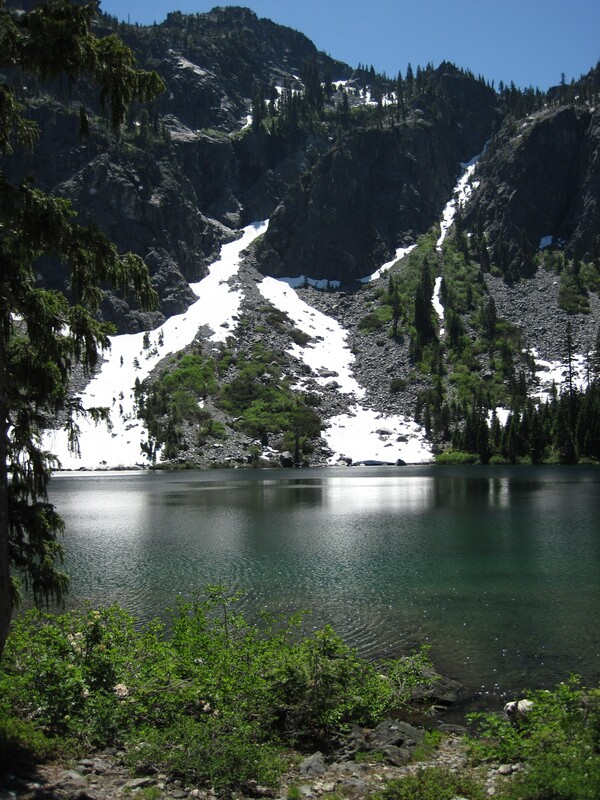 The Punchbowl ranks as the most awesome glacial cirque lake in the Klamath Mountains. The thirty acre lake sits crystal clear and inviting at the base of 1,500 foot granite mountains, including Bear Mountain, the highest peak in Del Norte County at 6,411 feet. Don’t let the name fool you, bears exist in this region, but are illusive. Even though you may not see one, you will probably see signs of bear and it is still important to keep all food and scented items in bear proof containers. Reaching the Punchbowl may be the goal of this hike, but there are other highlights of the trip which add to the glory of the day. The trail begins within the Bear Basin Butte Botanical Area which boasts a rich diversity of conifers and a colorful array of other flowering plants. July is a particularly good time to see wildflowers including blue penstemon, red castilleja, yellow stonecrops and white and pink cliff maids. Earlier in the summer sweet smelling native western azaleas will be in bloom. Tall floriferous mounds of these plants are right along the trail. Within the first half mile from the trail head you will pass Douglas-fir, sugar pine, noble fir and the thickest stand of Pacific yew on the trail. One mile in, at the wilderness boundary between the Smith River NRA and Siskiyou Wilderness, the under story is dominated by the vine maple which puts on a show of color in the fall and Sadler Oak, an endemic to the Klamath Mountain ranges. The Klamath Mountains contain one of the largest collections of unique conifers in the world and a whopping fifteen different conifer species can be seen on the trail. The most elegant of these is the weeping posture of the Brewers Spruce, seen along the entire trail. It is endemic to the Klamath Mountains and one of the rarest spruces on the continent. Continuing into the second mile the easy trail takes you past the only place where you will see Mountain hemlocks on the trail, and possibly the lowest elevation population of them in the state. Carrying on you’ll see white fir, lodgepole pines, and at the trail junction to Buck Lake is Port Orford cedar and just beyond, incense cedars. At 3.3 miles the trail forks at the turn off for the Punchbowl. Staying to the left will take you to Clear Creek National Recreation Trail. Taking a sharp right will lead you up a steep climb with continuous switchbacks for approximately the next mile. You’re likely to work up a lather in this section, but the pitch will ease up through a small valley before the trail turns to a path marked by cairns over bare rock. Don’t be confused by the first small lake you see, the Punchbowl is still ahead. Between the two lakes small Alaska cedars, which are at the southern most part of their range here, begin to dominate the drainage. Upon reaching the Punchbowl, a swim is in order. Cool water rinses the hard work of the hike away and alights the spirit. Sitting lakeside to dry in the warming sun is peaceful and soul soothing. 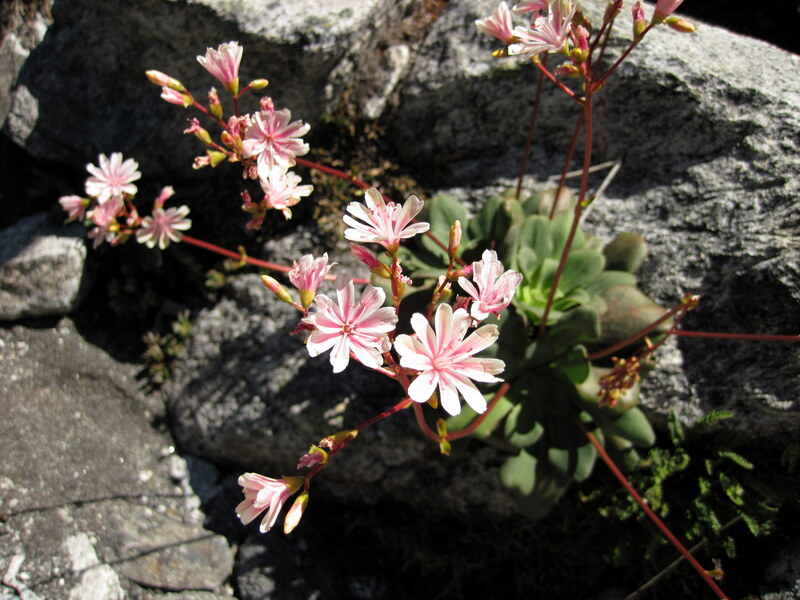 If your timing is right the banks of the Punchbowl will be colored pink with the tiny blooming cliff maid flowers (Lewisia cotyledon). Views from the lake encompass Bear Mt. and surrounding granite faces while a broad view of Preston Peak is visible to the northeast. Preston Peak is the tallest mountain in the area at 7309 feet. Unlike the rest of the Klamath Mountains, which are unrelated to the Sierra, the giant rock of Preston Peak is a granitic relative of the Sierra range, separated eons ago by the Cascade lava flows. 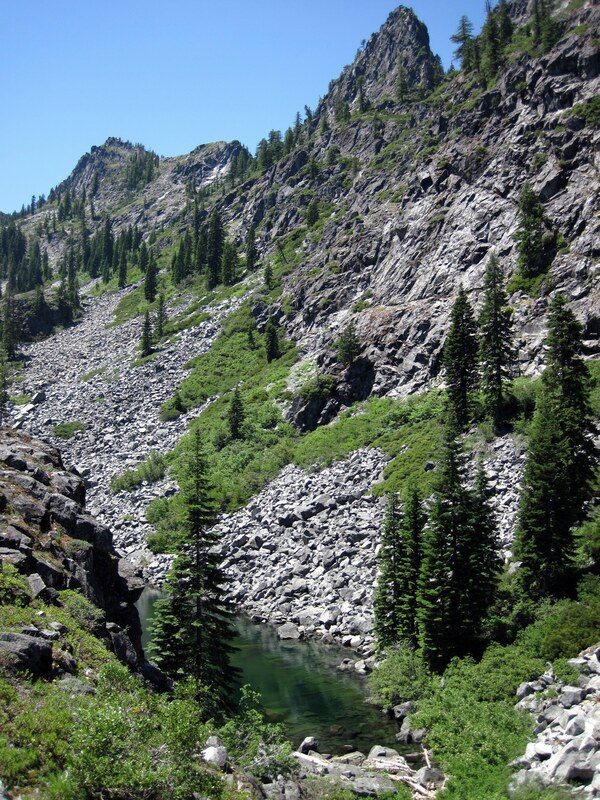 This hike is best done as a day hike from Doe Flat or a side hike of a longer backpack trip through the area to reduce camping impacts on the delicate subalpine landscape. Overnight campers will celebrate the quiet seclusion, but there are very few suitable campsites near the Punchbowl and leave no trace practices are mandatory. There is very little downed wood in this terrain so visitors should not make campfires. Fishing in the lake is good and popular so make sure to bring your pole and license. It will make for a long satisfying day, well worth the climb for stunning sub-alpine views and lakeside relaxation.